This paper presents an interface for designing freeform surfaces with a collection of 3D curves. 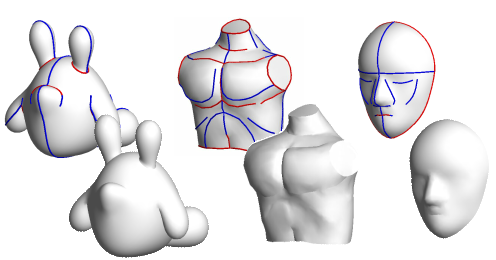 The user first creates a rough 3D model by using a sketching interface. Unlike previous sketching systems, the user-drawn strokes stay on the model surface and serve as handles for controlling the geometry. The user can add, remove, and deform these control curves easily, as if working with a 2D line drawing. The curves can have arbitrary topology; they need not be connected to each other. For a given set of curves, the system automatically constructs a smooth surface embedding by applying functional optimization. Our system provides realtime algorithms for both control curve deformation and the subsequent surface optimization. We show that one can create sophisticated models using this system, which have not yet been seen in previous sketching or functional optimization systems.